There is going to be an OAS picnic on Sunday, 27th August, on the field behind the Otford Village Memorial Hall, Otford. Bring your own food and drinks, and perhaps chairs. If it`s going to be sunny, then a small telescope may be fun to observe the sunspots, if any if anybody cares to bring one along. If the weather is rainy or inclement, then perhaps we can retire to the Bull pub opposite the field entrance/car park. I will put the list of possible participants on the table for the next meeting on the 26th July, so that interested parties can put their name on the list. It could be a fun afternoon, and if people are feeling energetic, they can walk the Solar System walk from the field, starting at the Sun at the far end. Let`s hope it is a good day out. What a shame I didn't know about this earlier as I've just agreed to help run a radio building workshop at Chatham Docks on that date. Would have been nice to see everybody. Oh well. Thought you were coming to August DSC which is the same weekend Mike. No I've bowed out Carole. I was asked to help a friend run the workshop and it is paid work. Plus, not keen on paying for the pitch if it is a gamble if the DSC would even go ahead or not. i will always go anyway to DSC just for the break from the rat race!! Please can you put our name on the list for the Otford picnic. I forgot to do it last night. Looking forward to it.Just found this web site with more info and map out to Pluto. I will bring the society PST and astrotrac mount - hope having put that I won't jinx the weather! Just a reminder ... the OAS picnic this coming Sunday. Start about midday until you have to go home. Bring you food, drinks, seats and any other necessary gear you need. If the weather is damp and `orrible then we can adjourn to the Bull pub opposite the car park. Look forward to seeing you all there. Keep your things crossed for a sunny and warm day. Sorry but just to confirm I cannot come to the picnic. It is my 70th birthday that day and there are celebrations of some sort ~ (but perhaps it is to the picnic)!! Last chance reminder about the OAS picnic. Hope to see you all there enjoying the warm weather... see you later. Doug. Thank you for organising the picnic Doug and Rose. It was a very enjoyable afternoon in good company. Although the sun joined us too only one sunspot and no prominences or flares to be seen with the society PST. Many thanks Doug and Rose for organising the picnic. It was a very enjoyable afternoon on a lovely sunny day. 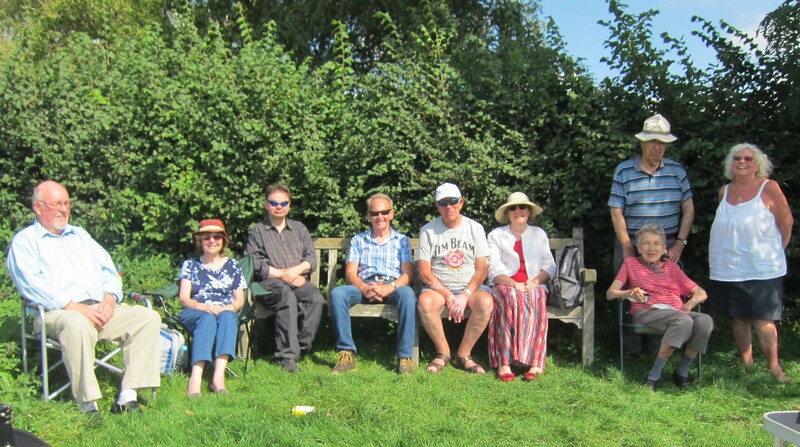 Thanks to all the members who came to the picnic on Sunday .... I like the fact that we were all searching for the shady bits by the hedge. I am glad that the weather was excellent and we had a good day. Thanks to Sue for bringing her PST Coranado; we did see one sunspot . Cheers and once more thank you all.